Disinfectants are essential for maintaining public health, but are also hazardous. Most common disinfectants can cause asthma, many are corrosive to eyes and skin or pose hazards to aquatic life, and some cause cancer or reproductive harm. To complicate matters, consumers cannot tell whether the products really work, since the targets are microscopic organisms. SF Environment, together with the Responsible Purchasing Network, has just completed a wide-ranging analysis of disinfectant products to help consumers make better choices, based on safety, germ-killing ability, compatibility with surfaces, and environmental impacts. Researchers compared health hazards, environmental impacts, germ-killing claims, surface incompatibilities, and other factors for 11 common active ingredients, 33 representative disinfectant products and 24 surface sanitizer products. This “alternatives analysis” also considered non-chemical options such as improved cleaning practices and the use of various tools, such as microfiber mops and electrolyzed water devices. Buying products as concentrates instead of pre-diluted formulations. Concentrates weigh 1/16 to 1/256 as much as ready to use products, which means substantially less fuel is required for shipping. Using “closed-loop” dilution systems, which automatically mix chemicals to the correct strength while keeping concentrates inaccessible to users. Cleaning surfaces well, which can reduce germs by 99% or more without the use of disinfectants. Using microfiber mops and cloths can dramatically improve the effectiveness of cleaning. 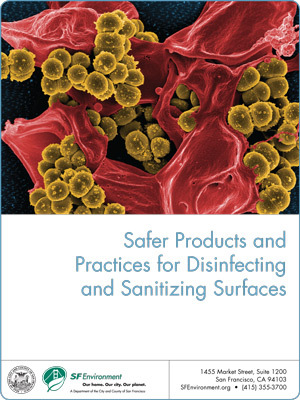 Limiting disinfectant use to high skin contact areas such as door knobs or sinks can also reduce product use without compromising public health.